The Thurber Prize winner struts his stuff. Doyle (Go, Mutants!, 2010, etc.) collects a dizzyingly diverse and consistently hilarious body of short humor pieces originally published in a variety of publications, making a case for the former Simpsons scribe as one of the premier practitioners of the form. Encompassing parody, absurdism, black satire, loopy ephemera and unhinged silliness, the author displays a mastery of varied stylistic approaches and comic voices, from the Pynchonesque t.V. to a bravura approximation of Mark Twain in Huck of Darkness, in which “lost” passages from Huckleberry Finn are re-inserted into the narrative, making the classic’s subtextual homosexual content decidedly more emphatic. It’s hard to pin a consistent comic philosophy on Doyle’s pieces, aside from a Simpsons-like devotion to dismantling the conventions of social and cultural mores with ruthless efficiency. Highlights include an epic wedding invitation tweaking the smug bride’s increasingly berserk instructions for those attending her special day; a letter from summer camp that reads like the fever dream of a young G. Gordon Liddy; a surreally pathetic newsletter detailing the continuing trauma and attendant delusions of a romantic breakup; and a savage, dog-centric takedown of memoirists in the manner of James Frey and Augusten Burroughs. 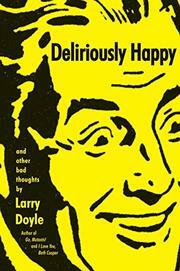 Doyle repeatedly employs such devices as absurd lists (pretentious ice cream flavors, ideas for pet stores) and magazine-style questionnaires to help pace the collection and suggest a formal consistency, but the greatest pleasure is the sheer range of tones and subject matter on display. An unpredictable, unfailingly intelligent demonstration of a unique wit given free reign.